Our goal is to not only teach kids how to swim, but to teach them to love and enjoy the water as much as we do! Our lives revolve around water and that would not be possible without first learning how to swim. Fun and safety are our top priorities and we ensure the best possible learning environment for your child. Group classes are maxed out at a ratio of 3:1 with no more than 2 classes going on at once. This allows for a calmer and less chaotic learning atmosphere. 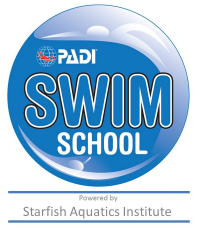 The PADI Swim School Curriculum is nationally recognized and teaches the proper swim techniques from the very beginning, allowing for an easy transition into swim team. The curriculum also emphasizes safety and will teach your child important skills for whenever they are in or around water. For example, asking permission before they enter the water and always making sure an adult is supervising them while they swim. These skills are the key to keeping your child safe and preventing water-related accidents! 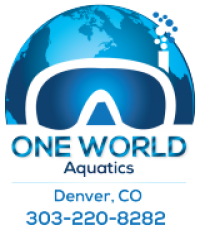 At One World Aquatics we allow 15 minutes in between each swim lesson so that parents and teachers can communicate progress and set goals for the next week! This also avoids parents, teachers, and students feeling rushed in and out the door! Parents and siblings can wait in our Parent Resource Room and enjoy our complimentary Wi-Fi and kid’s movies and books during your child’s lesson.